Although it's distressing for parents, head banging at bedtime or in the middle of the night is usually normal for young children. Head banging is usually thought to be a parasomnia (also known as a sleep disorder), like sleep walking or night terrors. Head banging is also sometimes classified as a rhythmic movement disorder, a neurological disorder that involves moving large muscle groups repetitively and involuntarily just before and in the middle of sleep. Children who have this condition may bang their heads into pillows, mattresses, the sides of a crib, or even the floor as they fall asleep or when they wake up in the middle of the night. Others rock their whole bodies or just roll their heads. It may occur as they are falling asleep or sometimes during non-REM (rapid eye movement) sleep. Other experts consider head banging to be a self-soothing habit, just like thumb sucking or hair pulling (also known as trichotillomania). In addition to head banging, some children hum or make other noises, and the episodes, all together, may last 15 minutes or more. It is estimated to occur in up to 15% of children who are growing and developing normally. Head banging usually begins during a baby's first year of life and tends to end between the ages of three and four. Does Head Banging Mean a Child Has Autism? Children who bang their heads do not necessarily have autism, but they could. Think about what time of day they usually do it. Unlike head banging that can sometimes be associated with autism and other neurological disorders, children with simple head banging typically do it only at night. On the other hand, when head banging or another rhythmic movement is a sign of autism, you can usually expect that the child will often do it during the day, too. Head banging is not harmful and typically goes away on its own, so no treatment is typically required. Since many children do it as a form of comfort at bedtime, any efforts to try and make your child stop head banging may increase her anxiety and make her want to do it more. 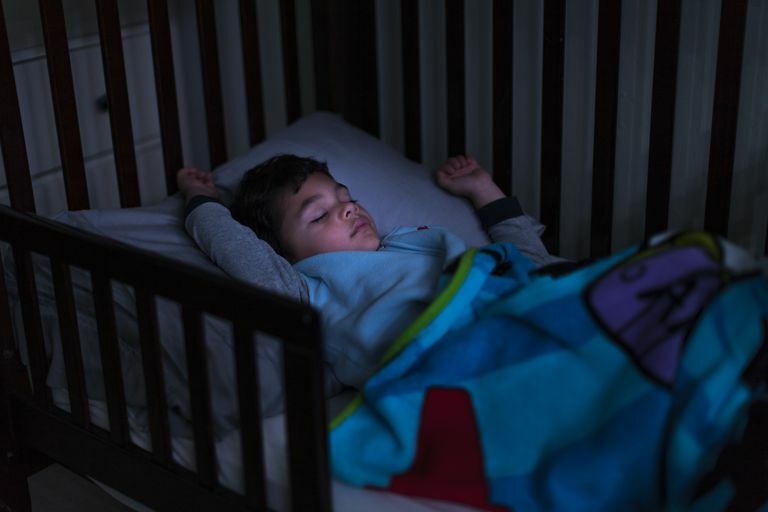 However, if you think that the head banging is disrupting your child's sleep, your pediatrician or a pediatric sleep expert might offer some suggestions as to how to decrease this behavior, such as the following. Offer an alternative bedtime comfort object, such as a blanket or stuffed animal. Stick to fairly strict routines for bedtime and naps. Make sure that your child is in a safe environment when she goes to sleep and can't hurt herself while banging her head. You want the crib to be sturdy, so it won't break or fall apart due to any aggressive head banging or body rolling. Be certain the screws are all tightened as much as possible. For kids who are too old for cribs, guardrails on beds may help prevent them from falling out of bed. Kliegman: Nelson Textbook of Pediatrics, 18th ed. Stores, G. Parasomnias of Childhood and Adolescence. Sleep Medicine Clin. September 2007; 2(3); 405-417. Should You Buy Your Kids a Trampoline? Yes, Your Child Can Strength Train!